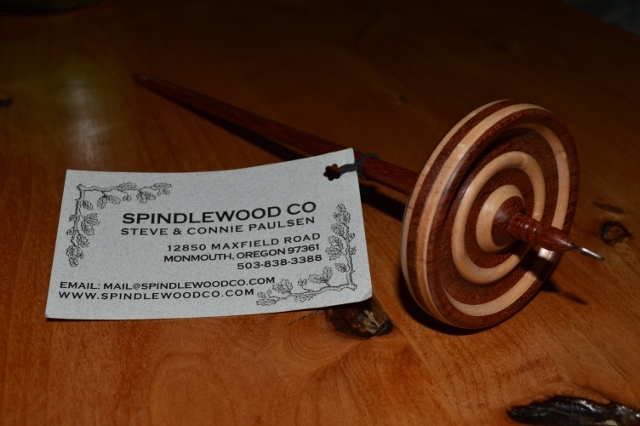 I got to spend last weekend with the knitters, spinners and weavers of the Columbia Gorge Fiber Festival. Yep; the Easter Bunny yarnbombed us! How cute is that? And just as I was about to launch into a discussion about blocking, the entire class from next door came in to sing Happy Birthday to me! They even gave me a handspun necklace. That's their adorable teacher, to the right of me, Sarah Anderson. If you ever get the chance to take a class with Sarah, don't miss it! And I *may* have found a little something irresistible in the marketplace. It's Bubinga and Maple, medium-sized at 2 3/8". Spins like a dream. How often do you get to shop for your own birthday present at a fiber festival, after all? About as often as your birthday lands on Easter Sunday, I'm thinking. I'm off to Minneapolis this weekend, to teach at Steven Be Fiberfest, and the Minnesota Knitting Guild Yarnover. Can't wait to see you, Knitters of a thousand lakes!